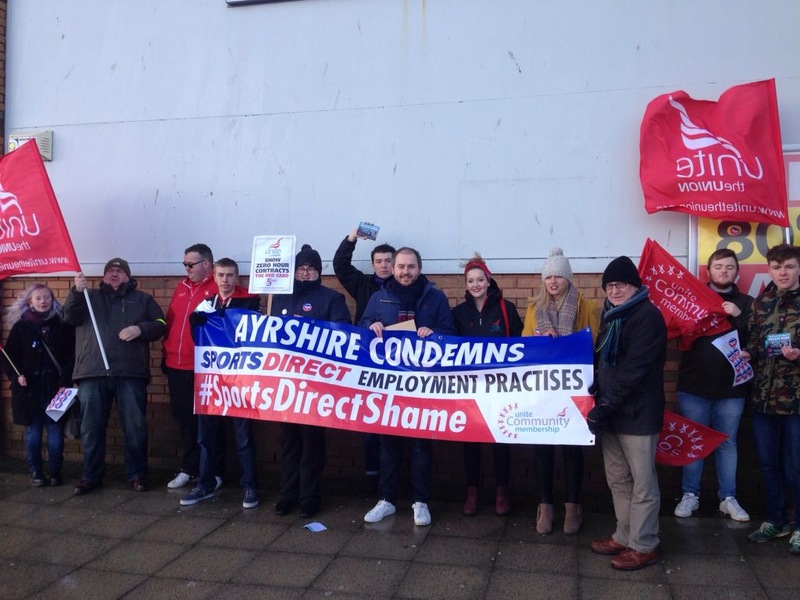 Unite Scotland community and young members ramped up their action against Sports Direct at the weekend (January 30 and 31) in a campaign that’s calling for decent work for all. Members marched through Fife, Dundee, Renfrewshire and Ayrshire to spread the word about Sports Direct’s employment practices. 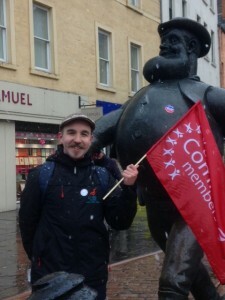 Unite activists have also received a significant political boost in their efforts to stop exploitative working practices by securing the support of Lothians MSP Neil Findlay and local councillors in Ayrshire and Renfrewshire. 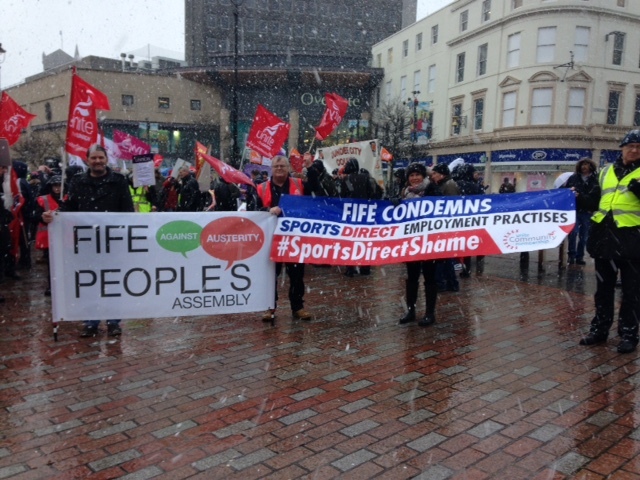 Political representatives hand-delivered letters to Sports Direct Store Managers in Irvine, Livingston and Paisley calling for the retailer, worth an eye-watering £3.4 billion, to end their pernicious use of zero hour contracts and pay their staff a living wage. Ryan Boyle, an ex-Sports Direct worker participating in the Unite community actions, recalled his time working for the notorious employer. “A multi-million pound company, owned by a multi-billionaire, use their workers as a source of cheap, disposable labour, who are trapped in the repetitive cycle of poor pay, zero hours contracts and insecure work conditions,” he said. 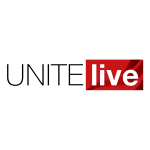 Unite’s ‘fight for 5’ campaign is calling for five different measures that will make decent work for all a reality — a wage you can live on; safe, secure work; guaranteed hours of work each week; training and development opportunities; and a collective voice through union representation. Unite Scotland’s community coordinator Jamie Caldwell said that their action against Sports Direct and the practices the company represents is only just beginning. “In the last month Mike Ashley has moved to deflect growing criticism by awarding a paltry 15 pence pay rise to his employees but now we have him on the run there will be no let up,” he said. “Around 1.8 million people across the UK are on zero-hours contracts with no entitlement to holidays, sick pay or security and the majority of those affected are young workers in the retail and hospitality sectors,” he added. “Sports Direct is one of the worst culprits and responsible for one fifth of all zero hour contracts in the UK retail sector, while owner Mike Ashley has made billions off the back of these draconian working conditions,” Caldwell went on to say.